Michelle Stewart changed her major eight times before discovering her passion. She began her adventure at Harper College, eventually traveling south to study marine biology at Broward College in Florida. When she soon came home to Illinois, the Buffalo Grove native enrolled at Roosevelt University for elementary education – until finding “that elementary ed wasn’t for me” either. On her return to Harper, she chose art. Stewart’s sculpture professor at Harper held a degree from NIU. So did her drawing professor. Both encouraged her to become a Huskie and, in 2012, Stewart came to DeKalb. Last May, she completed her BFA in sculpture – but her eight-year journey of higher education wasn’t done. Certificate students undertake a hands-on, best-practices learning experience guided by NIU faculty. They help to determine parts of the curriculum; study under alums and working professionals; and complete off-campus internships. 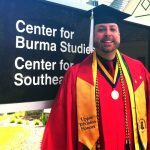 Most come with backgrounds in art history, studio art, anthropology and history, but some hold bachelor’s degrees in English or even the hard sciences. 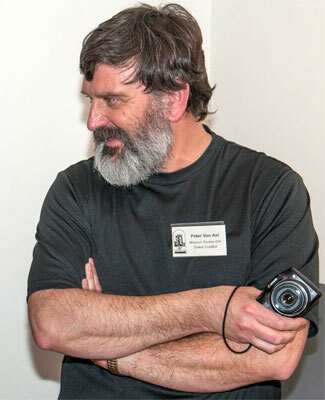 Peter Van Ael, coordinator of the Museum Studies program as well as the Jack Olson Gallery in the NIU School of Art and Design, focuses on experiential learning and applied theory. 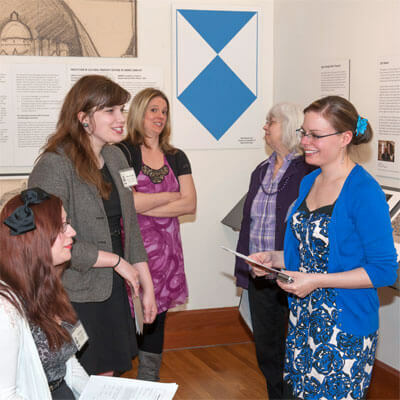 LAUNCHED IN 2002, NIU’s Museum Studies graduate certificate launches careers in public and private museums and related historical societies, archives and other agencies or institutions that work with artistic, cultural and historical materials. The 21-semester-hour certificate, operated jointly by three NIU colleges, includes five core courses, a focused elective, a practicum and an internship. 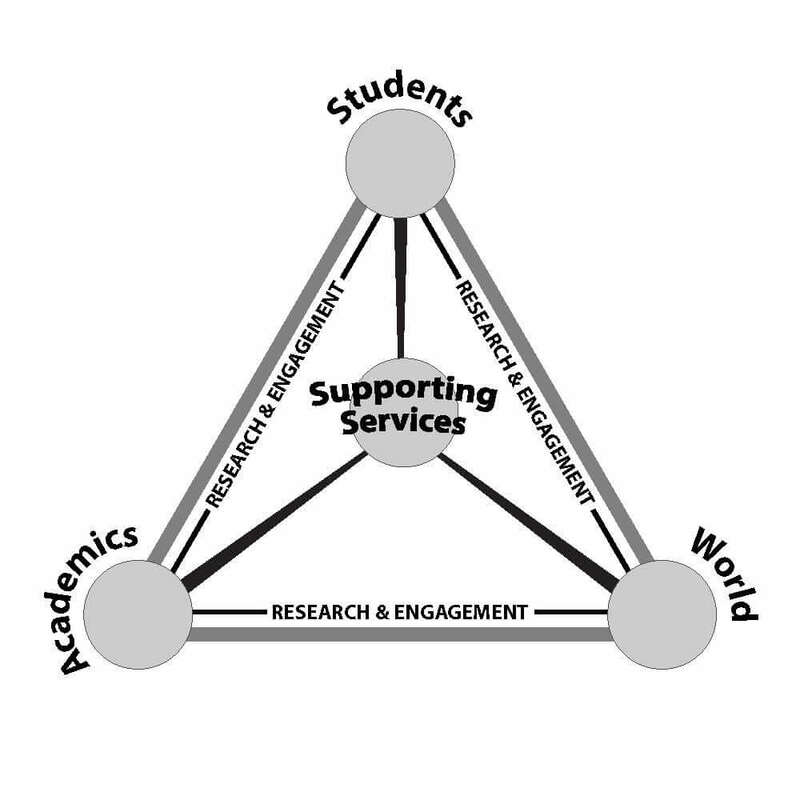 Enrollment can stand alone or in addition to a graduate degree program. During the fall semester course in curatorial practice, students must conceptualize, introduce and pitch ideas for the fall exhibition. The proposal that wins the class vote will eventually become a traveling exhibition. 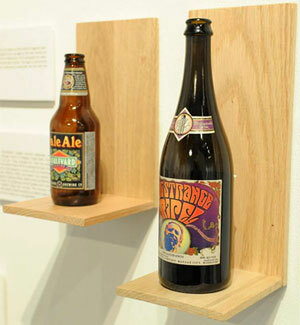 Some of the past “winners” have examined graffiti, tattoos, cultural property conflicts, the impact of the “green” environmental movement and, most recently, the art of craft beer. “Brewing Identity: The Art of Craft Beer,” traveling this August to the Geneva History Museum, was Stewart’s idea. “I led the project, and it was one of the first times I was in a leadership role. I was able to use what I had learned from the NIU Women’s Leadership Forum 2014. I’m really happy with the outcome of the exhibition,” Stewart says. 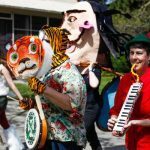 During the spring, students typically create an exhibition assigned by – and for – the NIU Art Museum. Their work involves research into the topic, developing the “story,” writing and editing. At the same time, the students begin thinking about the physical design of the exhibition. After those questions are answered, and plans are finalized, “then we start to look at whether any specific exhibition furniture needs to be built – we generally build those in the workshop of the School of Art and Design – and then we start to install the exhibition,” Van Ael says. Sophia Varcados, a supervisor in the Graphic Design unit of Creative Services (housed in the NIU Division of Marketing and Communications), advises Van Ael’s students on the creation of visual aspects for their spring semester exhibitions. 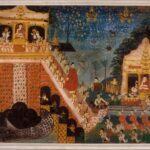 Varcados fields questions on everything from budgeting, choosing and acquiring supplies and scheduling production work to discerning good and bad fonts, arranging text with photos and selecting the best material for mounting exhibits. “Many of the students are new to the design/production aspect of museum work. It’s great working with them, because it’s an opportunity to encourage best practices. Peter takes the time to have them meet me, and then I give them my spiel. They hear me describe design and production methods to follow or consider, and they see the different materials and our workplace,” Varcados says. Varcados, and countless others like her, offer a critical outsider’s perspective with a nurturing touch. Sara Fitzpatrick is a collections intern at the McHenry County Historical Society and Museum in Union, Ill. 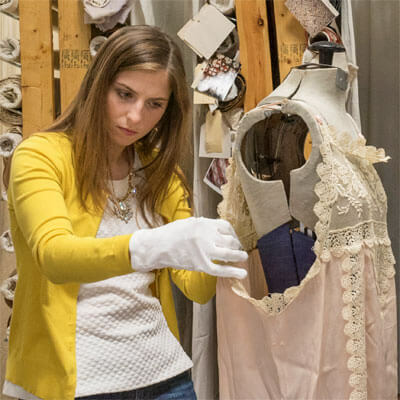 Since May 18, the Naperville native has been restoring and cataloguing much of the women’s clothing contained in the museum’s textiles and garments bases. A graduate of the University of Iowa, where she completed a bachelor’s degree in anthropology and ancient civilizations, Fitzpatrick already holds a certificate in museum studies from her alma mater. But the NIU graduate student in anthropology found no downside in earning a second one in DeKalb. Her current boss, McHenry County Historical Society Administrator Kurt Begalka, knows what that job entails. 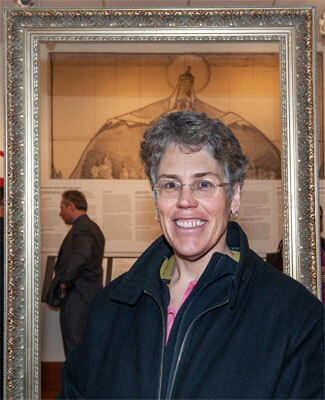 Begalka also realizes the quality of preparation Fitzpatrick is receiving: Kira Halvey, exhibit/collection curator at the McHenry County Historical Society, graduated from NIU in 2007 with a degree in anthropology and holds the museum studies certificate as well. “I am extremely proud of work that we do here at the society and the county history museum. For a small institution, with just three full-time staff, we have been able to achieve a lot – thanks to a dedicated board and a cadre of volunteers who embrace our mission and our unwavering desire to preserve local history for future generations,” Begalka says. 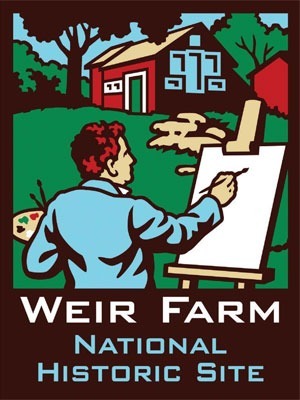 Michelle Stewart is spending an entire year someplace far from home: Weir Farm National Historic Site in Wilton, Ct. Weir Farm is one of only two sites within the National Park Service that focus primarily on the visual arts. 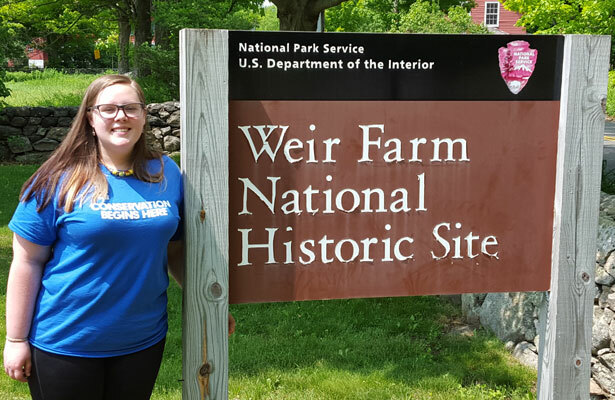 Stewart, a nominee for the 2015 Illinois Association of Museums Graduate Student of the Year award, will serve as a centennial volunteer ambassador through the Student Conservation Association. “Next year is the centennial of the National Park Service, so they created this position to help engage with the community and to bring in more volunteers to work at the parks,” Stewart says, adding that she expects to plan some events related to the 100th anniversary and around other holidays. The next 12 months will provide what she considers the final brick in her educational foundation. HER WORDS ARE AFFIRMATION to Van Ael’s ears. Part of the NIU Museum Studies program since 2005 and coordinator since 2010, he already knows that it works. Among the faculty are Stanley Arnold, Alex Aubry, Sinclair Bell, Bob Carter, Jennifer Kirker-Priest, Amy Levin, Dave Oberg, Peter Olson, Catherine Raymond, Brian Reis and Pamela Rohleder. Winner of several awards from the Illinois Association of Museums, the program boasts alums working everywhere from the Ellwood House Museum, the Flagg Township Museum and the Elk Grove Village Historical Museum to the Field Museum and the Mark Twain House and Museum. Spring 2014 Museum Studies students and alums chat during a reception for “Looting, Hoarding, Collecting … Museums and Repatriation.” From left: Mari Oates, Allison Sutton, alum Rebecca Weinstock (former director, Flagg Township Historical Museum in Rochelle), alum Kathy Johnson (current co-director, Flagg Township Historical Museum) and Tiffany Arnold. Students also have provided consulting services to the Boone County Historical Museum on facilities use and collections interpretation; that collaboration led directly to one student landing a job to reinterpret the museum’s permanent military exhibition galleries. Meanwhile, every autumn’s unexpected exhibitions keep it fresh for Van Ael and relevant for the students. “Our program really prepares students for what they are going to face in a museum, although museums don’t have the constraint of an academic calendar. For what might take three to six months at a museum, we have about nine to 10 weeks,” Van Ael says. Previous story Can You Feel the Love Tonight?